HelpChat app is now offering flat Rs.80 Cashback on your First ever OLA/Uber Cab ride worth Rs.80 or more. You can book Uber/OLA Cab directly from HelpChat app no need to download their app. Maximum & Flat Cashback is Rs.80 only. 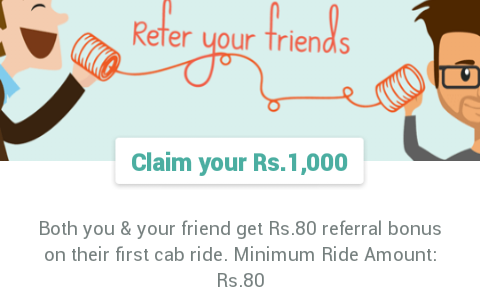 - Your friend must be booking his/her's first cab ride - You both will get Rs.80 Cashback free! • Now open the app , enter your mobile number and click on "Get Started"
• Now you will be asked to fill your account details > Do so and continue. √That's it! Your Ride has already booked & Your Cashback will be credited to your HelpChat wallet within 48 hours. • Copy the link & Share it with your Friends. • As soon as your friend downloads HelpChat app & Books his/her's first ride worth Rs.80 or more you will get Rs.80 Cashback free. Update : If your fare is Rs 200, you will get Rs 200 cashback from RIDENOW coupon + Rs 80 cashback of referral. So a total of Rs 280 cashback. - Helpchat reserves the right to, without liability or prejudice to any of its other rights, at any time without previous notice and from time to time.